The railtour organised by Greater Anglia at the end of April offered the rare combination of two ‘37s’ on just four coaches and the chance of a non-stop run from Liverpool Street to Norwich. 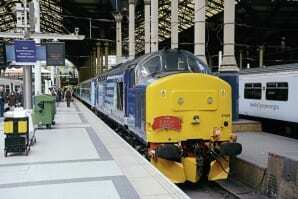 IN railtour terms, Greater Anglia’s trip on April 30 was a simple offering. Using the loco-hauled ‘short set’ that normally plies between Norwich and Great Yarmouth/Lowestoft through the week, ‘The EACH Express’ would run from Norwich to Ely and back, then Norwich to London Liverpool Street and back. Its success, however, in raising around £20,000 for the EACH (East Anglia’s Children’s Hospices) proves that complex itineraries and multiple loco changes are not always necessary.